DESCRIPTION: Up to 13.5mm. 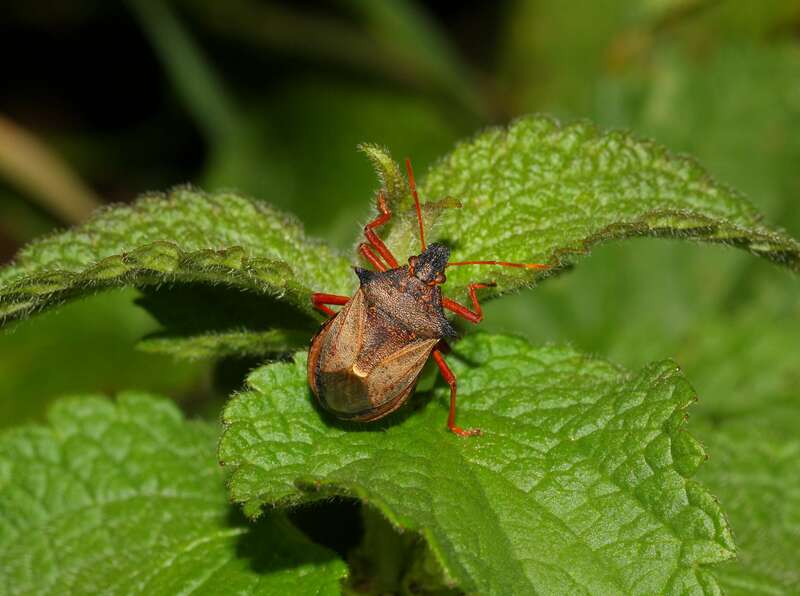 A brown shieldbug whose main identification features are the reddish-orange legs and the two thorn like projections from either side of the pronotum. The rear end of the insect is very rounded and the antennae are concolorous with the legs. BEHAVIOUR: Usually alone or in small groups on vegetation. Can overwinter in egg and larval stage. Both adults are young are predatory and will feed on insects especially caterpillars although they will take sap from leaves. DISTRIBUTION: Common and widespread in southern Britain. HABITAT: Hedgerows, woodland edges and lush vegetation all near water. PERIOD: July to November.